GF3 offers slight advantage on AF point selection using touch screen, plus some fanciful touch-shutter functions that are generally more fun to use. But I would still prefer NX menu layout. GF3 has the fastest AF and highest fps, but the screen does not look sharp. It can shoot full HD but in MTS (BD) format and not the PC-friendly MP4 format. You can shoot MP4, but only 720p, and audio quality is poorer. Being micro four-thirds system, GF3 offers lots of lens choices, and has the fastest shooting response among the three. NEX-C3 offers the best screen display. I feel a big sense of gratification after I take the shot and seeing the images on the screens. I also like how the icons are high-res and neat. ISO quality is the best among the three. The build quality is the best among the three, and has the most unique design. With NEX, I can shoot at high ISO and I get more clear shots than the rest, because Sony is confident in its high ISO and aggressively sets high ISO for its auto shots. Sadly, its shutter sound is the loudest and most annoying. NX100 offers the best handling and ease of making shooting adjustments. I can use the hot-shoe with legacy photographic accessories. Spec-wise, it is not as impressive because it’s the oldest model among the three. The ISO noise is the highest but comparing to the compact cameras, it is still good. This is the best camera among the three for speedy manual shooting controls. ILC or DSLR? I still don’t get the same experience from the ILCs as I do with DSLR. While I find myself struggling to try to get ILC to match the quality of DSLR, I feel so effortless shooting on a DSLR to get what I want. DSLR offers me the organic experience that no other ILC can provide. Yet we must not forget that the ILC offers a solution of comparable DSLR image quality and handling in a very compact size. I do not foresee myself investing heavily or permanently in an ILC system, so I am happy to buy any system with a set of basic lenses to cover a wide shooting range. My purchase decision would not have to depend on the system expandability and compatibility. I would focus on shooting speed, ISO quality, ease of shooting controls. My perfect ILC camera would consist of the user interface and shooting controls of NX, body design and ISO quality of NEX, and shooting speed of GF. 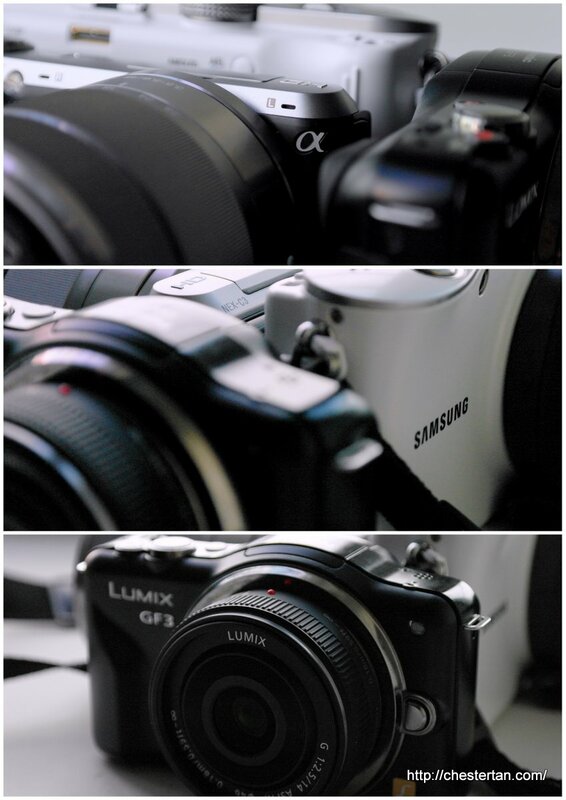 In the absence of perfection, my choice of camera among the three would be Lumix GF3. And that’s just me. There is no “best” product decision. It’s just understanding your needs and meeting it.